Over the weekend (Sept 26-28) Seattle was host for the First Annual Steamposium, a new steampunk convention filling the gap felt in the community after SteamCon Seattle fell through after five years. I must admit I was skeptical that Steamposium would be able to fit the bill given how quickly they pulled everything together: I have rarely been so pleased to be so wrong. 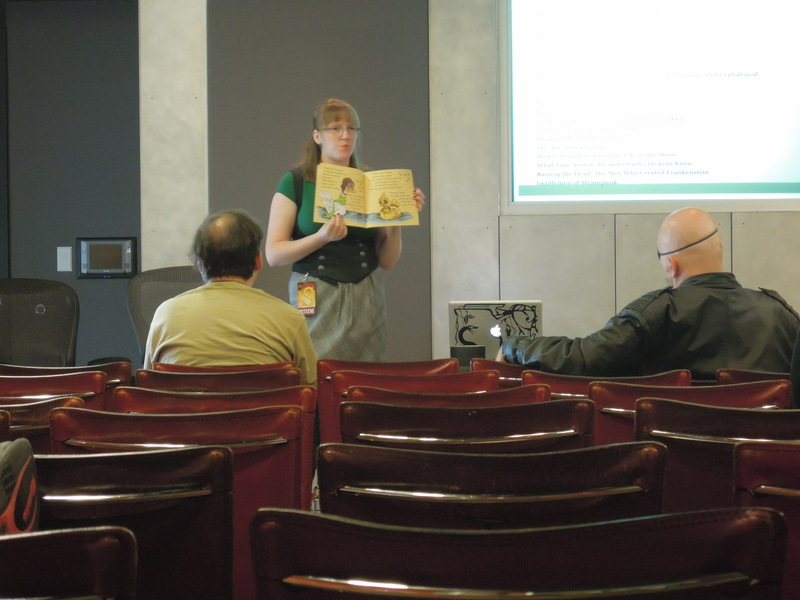 I hosted a one-hour panel during the Friday 3pm block that was one part discussion about the Steampunk Library Project and one part book talk about my favorite pieces to create a core steampunk library. Despite my nerves causing my originally 35 minute presentation to only last 27 minutes, the event as a whole was quite a success! There were lots of questions, interest in the specific books I discussed, and over a dozen attendees. Over the course of the weekend I gave out about 100 buisness cards: people taking them at the panel, giving them to people I talked to, a small stack to the Other Worlds Book vendor table, and a few strategically left at the water table. Thank you so much to everyone who turned out to support this project. I’m looking forward to my next wave of content updates including a lot of community input and new reviewers. I believe the Steamposium creators learned several valuable lessons from the business failings of SteamCon, and one of those lessons had to do with location. The Bell Harbor International Convention Center was a fantastic venue: on the water, walking distance to Pike Place Market, and surrounded by food and parking. The water made for a great background for photos, a ton of which can be found via the Steamposium Flickr and Steamposium Twitter. Be sure to look for Steampunk Iron Man and Boba Fett. Add-Ons: I loved being able to really customize my con experience by choosing which events I wanted to buy tickets for and which I didn’t. Variety: I loved the variety of material presented in the panel schedule. 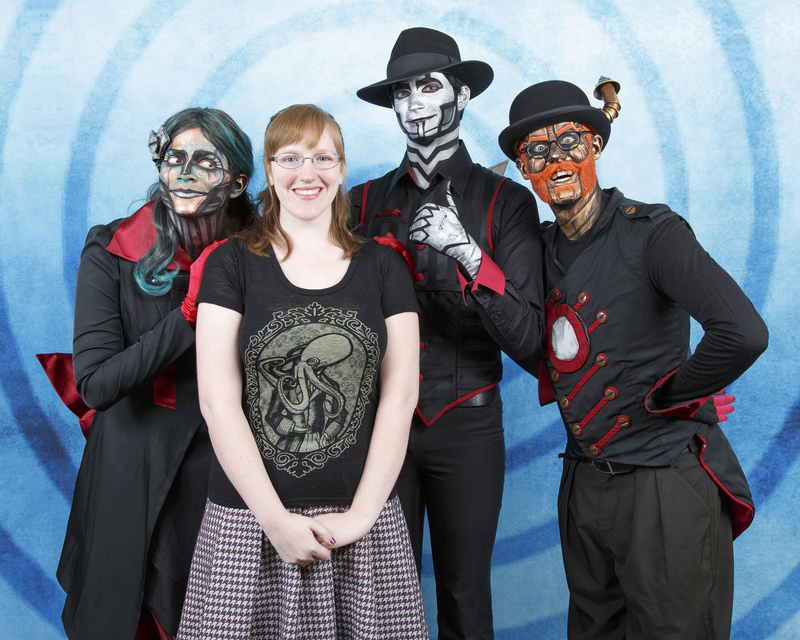 And my favorite part of the experience: Steam Powered Giraffe. That is the face of name-forgetting-levels of joy. From left to right: Rabbit, The Librarian, Spine, and Hatchworth. I had the opportunity to do a photo-op and visit the autograph table on Saturday. During the photo I completely forgot my name and only barely redeemed myself during the autograph session. I fully intended to go to the table and express my admiration for the band and share how they were a founding piece of this project (and therefor a major piece in completing my Masters) but I’m fairly certain I only awkwardly shook their hands and babbled a bit. Ah well, still the highlight of the weekend. This may be more of a difference in priorities, but I wish the convention had more panels and fewer dances. Personally, I’d rather keep attending sessions and meeting with writers and cosplayers than attend a second set of parties and cabarets. Along the same lines, timing was an issue. The panels and merchant hall would open at 10am (noon on Friday), but would be all wrapped up at 5pm. As someone who was traveling down from the suburbs for the events, I would have liked it if things had started a little later and ran a little later into the evening, particularly on Friday as I felt a lot of panels I attended suffered from low attendance since many Seattleites were likely still at work during the bulk of 12-4pm time slots. For me, the pros greatly outweigh any negatives I felt towards the scheduling. It was a well put together event in a great location and had a wide variety of offerings for everyone. And it gave me the opportunity to talk about this little project with a lot of people I never would have had the opportunity to meet otherwise. Bottom Line: Will I be going again? Absolutely! In fact, you can already pre-purchase full weekend passes for only $40 on their site now. Look for another update once they begin accepting panel/workshop applications. Please share your experiences from Steamposium 2014 in the comments below or send your thoughts and pictures to share via submissions@steampunklibrary.net or via Twitter @SteamLib. Thank you so much to everyone following and sharing on this site and re-tweeting, sharing, and commenting on Twitter (@SteamLib)! This project is a labor of love and the support and enthusiasm of my followers make it all worth while. I’d also like to say a huge thank you to the ladies over at SS Librarianship, a library-life focused podcast hosted and produced by two of my UBC SLAIS classmates. I was lucky enough to get to talk about all things steampunk on their episode titled “I Can Do It My Damn Self” which you can listen to via their site. Want more Steampunk Library content? You can become the content! 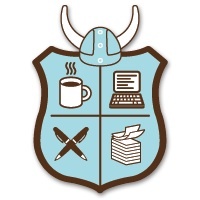 In making this project a community resource I am always looking for library programs, displays, and crafts as well as reviews of books, music, movies, and websites. Any material can be sent to submissions@steampunklibrary.net and will be posted here. Please including any links and the name you’d like listed in the by-line (and your Twitter handle if you have one). Want to get involved in person? 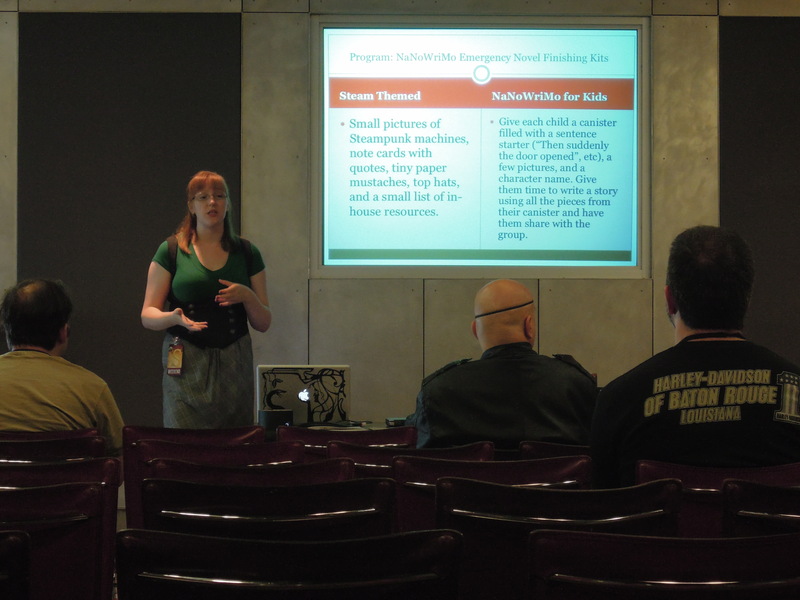 I will be presenting at the Steamposium Seattle Steampunk Convention in September. Conventions are great opportunities for steampunk fans from all walks of life to network and find inspiration. In addition to great panels the convention will also be hosting musical guests Steam Powered Giraffe and celebrity guests from around the geeky universe. I hope to see lots of bookworms and educators gussied up in their finest top hats. Summary: Some seventeen-or-so years in the future, the remainder of human life on Earth lives on a single train, which is in constant motion across the planet. A global warming initiative taken on by world powers in 2014, of which the viewer learns in radio broadcast flashbacks at the beginning of the film, created a second Ice Age whose effects were so rapid that nearly everyone died. The Snowpiercer is the engine which sustains life for the wretched few that have managed to survive. This train hearkens back to a bygone time in which the (steam) engine was the pinnacle of modernity, although the Snowpiercer and its “eternal engine” is clearly vastly different in terms of its operation. As the vessel moves throughout this tale, the viewer sees it blast through ice formations in a snow-covered world, and learn increasingly more about this mysterious yet powerful conveyance right up until the end of the film. While the engine itself may be the namesake and setting for the film, the story centers around the efforts of passengers of the “tail” of the train to better their conditions, led by Curtis (Chris Evans). The tail and its residents are unspeakably filthy, abused regularly, and the residents of these crowded and labyrinthine quarters get by on slippery-looking “protein” bars as their only source of food. Guarded ferociously by men in full military gear, occasional visits (and speeches) by Mason (Tilda Swinton), the conductor’s right-hand woman make it clear that the conditions for passenger cars more towards the front of the train are idyllic in comparison. Determined to fight against the injustices that are perpetrated upon the tail passengers, Curtis leads a blood-saturated charge to the front (just another in a long history of revolts) with the help of a drug-addled man named Namgoong Minsu and his daughter Yona. Interspersed with scenes of violent clashes (so fierce that this reviewer had to look away) are glimpses of how the other half lives – in luxurious comfort and good health. This constructed dichotomy between the haves and have-nots is not new, and divisions of humans predicated on class or socioeconomic standing in such a way also alludes to a more historic origin than the futuristic setting of Snowpiercer. Bottom Line: Including this film in a list of steampunk resources may seem like kind of a stretch, as the engine isn’t steam-powered, but the class struggles and train setting decontextualizes the tale from its temporal situation.